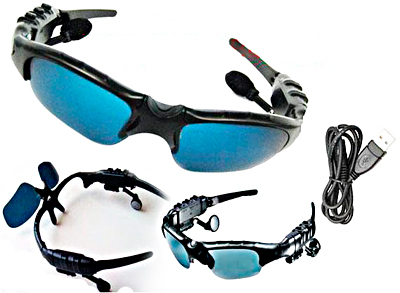 : bukan nak promote..cuma nak kongsi cerita..
WMA + MP3 Player Sunglasses 2GB - Stereo Sound Effect. Cool looking sunglasses / MP3 shades with 2GB + MP3 and WMA player built in as well as high quality earphones for great stereo effects. YG ADA BLUETOOTH TU OK JGK.. HARGA TU LATEST PUNYA MARKET PRIZE KE? TP SLALU NYA DIPAKAI UTK JOGGING ATAU RIDE BASIKAL SBB KALAU DGN MOTOR NI NNT SANGKUT DIA PUNYA TANGKAI PD HELMET..
tu lah tu... nak kena try gaks tu... kalu masuk ngam masa pakai helmet, nescaya ramai lah yg nak sambor... termasuk aku.. kihkih..
AKU PUN... KIH KIH KIH..
Masunaga Optical Mfg Co., Ltd., who founded the optical industry in Fukui in 1905, and Scalar Corporation jointly developed the Teleglass whose design was made by KAZUO KAWASAKI. Teleglass T4-N enable you to enjoy the images from outside devices on a large screen (equivalent to 45-inch screen 2m away from you) with high resolution about 310,000 pixels (640(H) x 480 (V): about 920,000 picture elements) directly with your both eyes and enjoy sound by the furnished ear phones (Audio (L/R)28ｍW+28ｍW) at the same time. You feel easy because you can see the surrounding areas too. We made display part small and light (50g) weight so that it can be attached to the glasses. As a result, the monitor does not need to cover your whole eyes and you can wear it just like sunglasses. Because you can see the surrounding areas, you can enjoy images and music easily and comfortably even in a train or an airplane as if you were at home. In addition, with T4-N having eye width adjustment functions and vision adjustment functions of left and right, you do not get tired even if you use it for a long time and anyone can enjoy beautiful images which are well focused.